These banana muffins are so easy! See how we make banana muffins that are fluffy, moist, and taste amazing. I love adding chocolate chips, but you can leave them out or swap them for nuts. Jump to the Easy Banana Muffins Recipe or watch our quick video showing you how we make them. These muffins are so easy to make, anyone (even kids) can make them. There are no fancy ingredients and everything you need to make these muffins is probably already in your kitchen. The batter takes less than 10 minutes to put together. They keep well and can be frozen for treats later in the month. Let Me Show You How To Make The Best Banana Muffins, You’ve Got This! These easy banana muffins come together quickly and you don’t need any fancy equipment to make them. So whether you bake all the time or this is your very first time, I promise you’ll be a banana muffin baking superstar in no time! Flour — I prefer to use all-purpose flour, but whole wheat works well in this recipe. 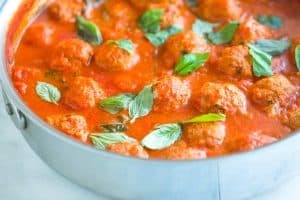 You can also substitute your favortie gluten-free flour blend. Brown sugar — Sugar adds moisture, sweetness, and makes the muffins tender. If you only have white sugar, don’t worry, you can use it instead. Baking powder and baking soda — These are both leaveners and are what make the muffins rise. Salt — Just a tiny bit of salt makes these muffins ultra-flavorful. You don’t need a mixer to mash bananas — a fork works perfectly fine. For this banana muffin recipe, we need 1 1/4 cups of mashed banana. That means you’ll need two large or three medium bananas to make the recipe. I mash them in the bottom of a mixing bowl so I can fit the rest of the muffin ingredients. 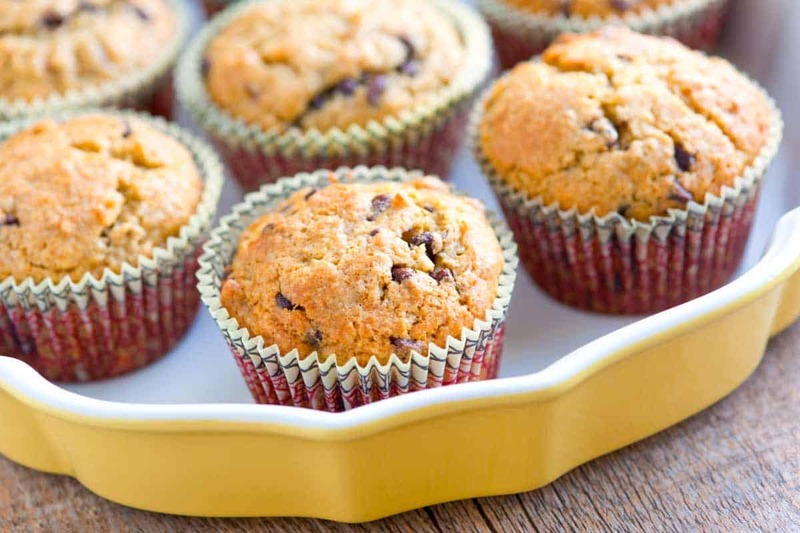 Just like when making banana bread, the bananas you use for these easy muffins matter. We want the bananas to be sweet and extra ripe. If your bananas have lots of brown speckles on them or are black, you are well on your way to making the best banana muffins of your life. I use a fork to mash the bananas. 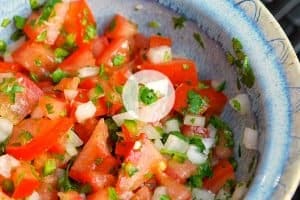 No mixer or fancy equipment required. Melted butter — Butter adds a luscious, buttery flavor to the muffins. For banana bread without butter, you can substitute oil. Muffins with oil won’t taste as rich, but the texture will be light and fluffy. Egg — An egg adds structure and tenderness to the muffins. For eggless banana muffins, swap the egg for a flax egg (I’ve provided instructions in the notes section of the recipe). Vanilla extract — I barely bake anything sweet without a splash of vanilla extract. It adds richness and a sweetness that sugar doesn’t really provide. Melted butter, egg, and vanilla makes these simple banana muffins tender, buttery, and delicious. 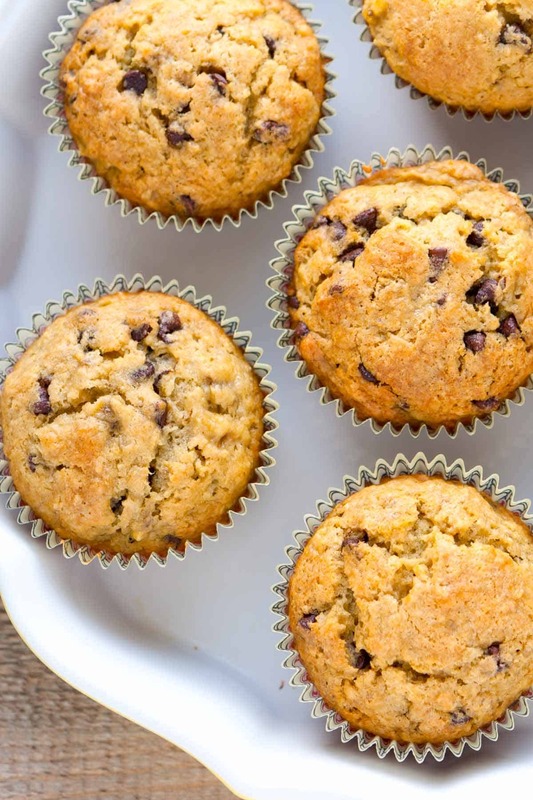 The last step for these banana muffins is to combine the dry ingredients with the wet ingredients and if you are adding them, stir in chocolate chips. I don’t know if you can tell from the photos, but I add mini chocolate chips to my banana muffins. The mini chips make sure you get a chocolaty bite every time. I actually use mini chocolate chips to make banana bread, too. In this easy chocolate chip banana bread recipe, I love combining mini and regular chocolate chips. I love using mini chocolate chips so every bite has little bits of chocolate in it. How Long Do The Banana Muffins Bake In The Oven? The muffins take 20 to 25 minutes to bake. You can tell when they are done when the tops are golden and after inserting a toothpick in the center of a muffin, it comes out clean. For mini muffins, the bake time will be less. I’d expect 10 to 15 minutes. If you love banana muffins, you will love banana bread! Here’s our classic banana bread recipe. For a lighter version of these muffins, take a look at our Healthy Banana Blueberry Muffins. 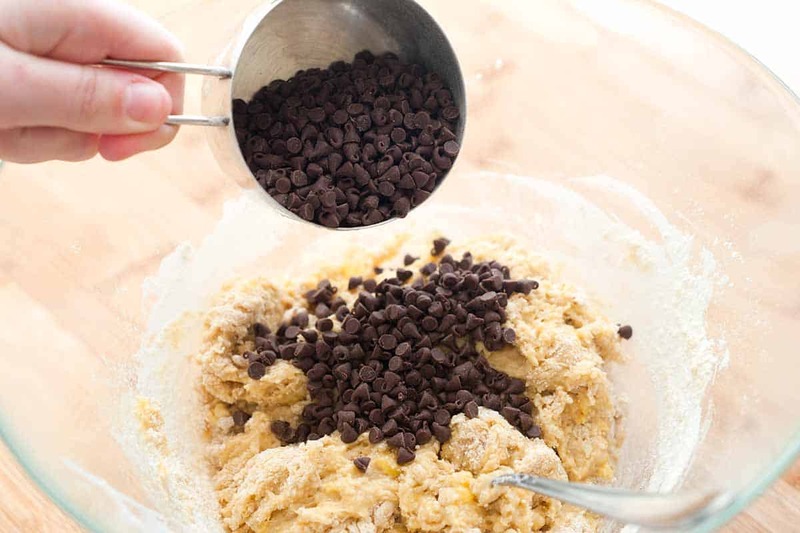 In that recipe, we swap olive oil for the butter, use whole wheat flour and add blueberries instead of chocolate chips. Our Perfect Banana Pancakes made with buttermilk, mashed banana, and spices are such a treat! Use leftover bananas to make our Super Quick Banana Smoothie or this Easy Banana and Strawberry Baked Oatmeal. For the best banana muffins, use very ripe bananas. In fact if you can wait a day for browned, overripe and speckled bananas, they are even better. Just before baking, we throw in mini chocolate chips. You could leave them out or swap for regular chocolate chips or fruit like blueberries or strawberries. Heat oven to 350 degrees Fahrenheit. Line muffin cups with paper liners. This recipe makes more than 12 muffins, so you will need to bake in batches. Whisk the flour, brown sugar, baking powder, baking soda, and salt in a large bowl. 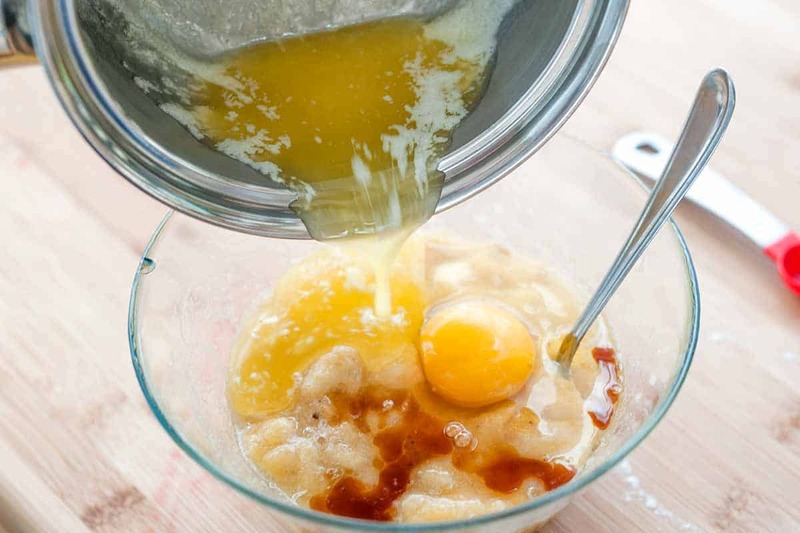 In another bowl, whisk the melted butter, mashed banana, egg, and vanilla until blended. 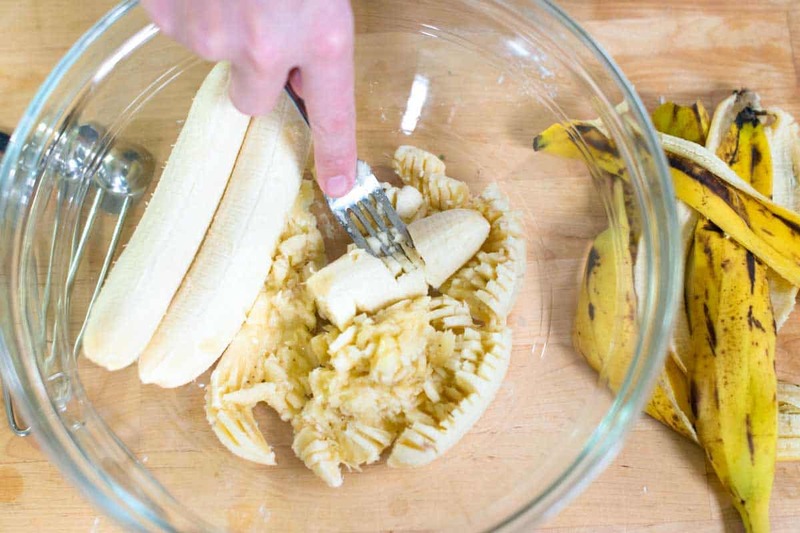 Add the banana mixture to the bowl with dry ingredients then use a fork to combine. Do not over mix. Stir in chocolate. Fill muffin cups 3/4 full. Bake until a toothpick can be inserted and comes out clean, 20 to 25 minutes. For mini muffins, expect that the bake time will be 10 to 15 minutes. 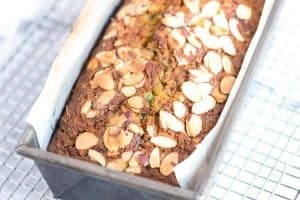 Vegan / egg-free banana bread: Replace the egg with a flax egg. To make a flax egg, mix 1 tablespoon flaxseed meal (ground raw flaxseed) with 2 1/2 tablespoons water. Set it aside for about 5 minutes to thicken then use to replace the egg in the recipe. Nutrition facts: The nutrition facts provided below are estimates. We have used the USDA database calculator to calculate approximate values.